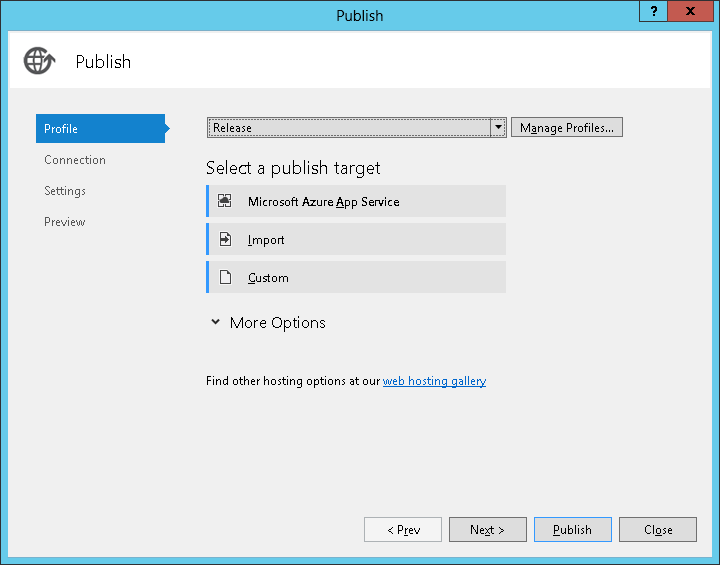 In order to publish a .Net application using Microsoft Web Deploy, your solution will need a couple things. 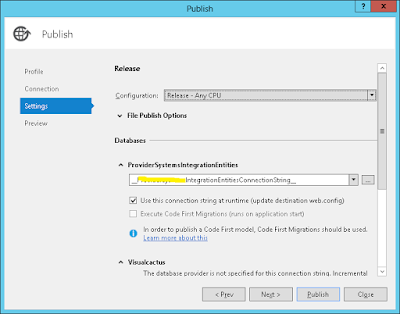 Enter a name of Release and copy from an existing configuration if you choose. The step to copy from an existing configuration is not critical as the config transform we create next will take precendence anyway. Expand the project containing the config file you need to transform, right click on the web.config file and choose Add Config Transform. If this option happens to be greyed out, it means your project already contains transform files for each defined configuration. In this case, the transform being used is SetAttributes and the attribute being set is debug. Alternatively, you could use the following transform to achieve equivalent results. Another example is the customErrors node. In this case, the Replace transform is used and as you can see, it replaces the entire contents of the customErrors node. In addition to the Locator attribute, there is also a Match and an XPath attribute. Now that we have created a transform file, we need a publish profile to create the deployment package. To do this, right click on your main project in the Solution Explorer (probably the one that has your web.config file). From the popup menu choose the "Publish…" option. In the "New Profile" window, enter a name for the Profile. For our purposes in the context of an automated release pipeline, you’ll just need one for ‘Release’. Click the "OK" button. This should take you to the Connection screen. 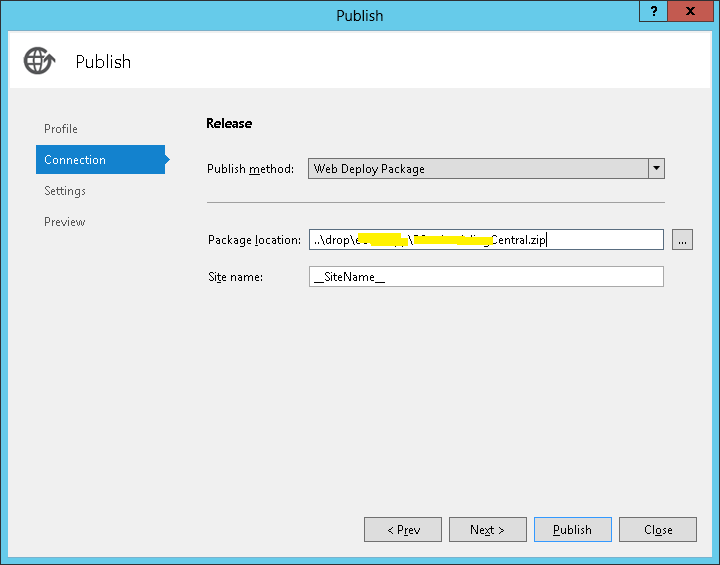 Choose “Web Deploy Package” for the Publish method and fill out the remaining information on this screen. A good convention to follow is to specify a “drop” folder to contain your deployment packages whenever you perform a local publish operation, it just keeps things cleaner. If your solution contains multiple “web” applications (UI, API, etc…) you will want another folder level to hold the deployment artifacts for each individual app as shown as well. With a single app, the extra level isn’t needed. Don’t worry about creating the folder structure, the publish tool will take care of that for you. As you can see in the above screenshot, the value entered for the Site name field is merely a tokenized placeholder, not the real value. We’ll get into tokens in a little bit. Click Next. If your application contains any database connection strings defined in the web.config, they will be listed on this page. Again, you can see where the values have been tokenized. This final screen simply allows you to verify your settings so far before you actually publish the application. 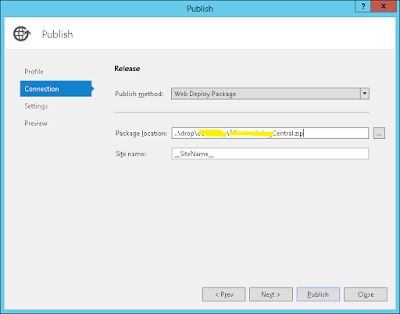 Click Publish to create the deployment package. If you browse the contents of the publish location, you will see something like the following. In the output above, you can see a file called .SetParameters.xml. 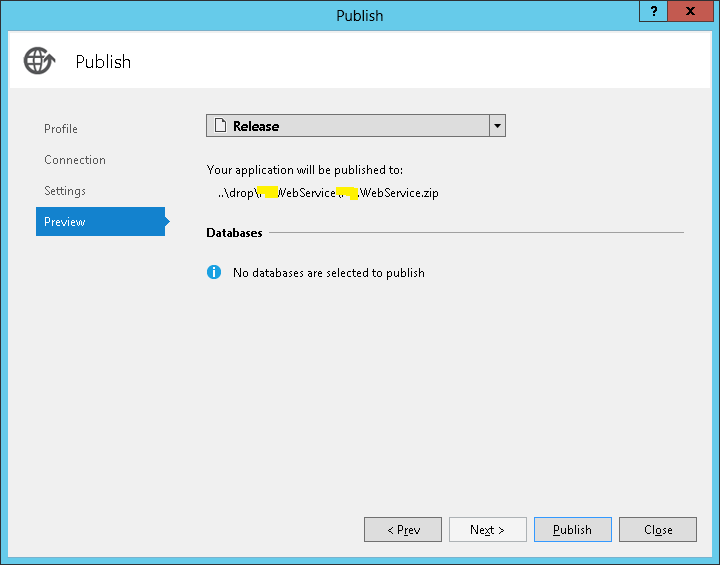 This file is generated for you by the web deploy package publishing wizard. Looking inside that file will show you something like the following snippet. Each parameter in the file is driven by one of two things. Either you specify a parameter in the publish profile, or you create a special file called Parameters.xml and add it to your project. Go ahead and do that now. For each parameter that you define in the Parameters.xml file, the web deploy publish wizard will add a corresponding entry in the .SetParameters.xml file. The syntax for the Parameters.xml file is shown next. As mentioned above, you can define additional parameters in the Parameters.xml file to be included when you publish your web application. These are most commonly things like appSettings key/value pairs as shown in the below snippet. It is not necessary for the parameter “name” and “defaultValue” attributes to be consistent as shown above, but it is a good convention to follow and avoids unnecessary confusion. The “defaultValue” attribute is critical as it will define the token that will be replaced with the actual value at deploy time and the tokenization task in TFS/Release Management must be able to find an exact match based on that token. The “parameterEntry” node defines how your parameter can be correctly identified in your web.config file. Even though there are other valid options for the “kind” attribute, the only one we will concern ourselves with is “XmlFile” as that sets the provider for Web Deploy to use. The “scope” attribute specifies a RegEx to identify the path to the file containing the parameters. The “match” parameter is the XPath expression to the specific value in the config file.